Finding ISP web hosting services before the Grim Reaper finds them. General discussion at #webroasting on EFnet. Adam Internet Australia http://users.adam.com.au/USERNAME/ Online! Not saved yet Defunct ISP ~ 2013. Absorbed by iNet, iinet -> TPG. Some users are inside subdirectories like /blues/, /comics/ or /crazy2/ . You will need to treat /blog/ specially, it has an infinite calender (if Schbirid recalls correctly). Arcor Germany http://home.arcor.de/USERNAME/ Offline Partially saved archives A "Top 10" is available on http://www.arcor.de/tp/hph/hph_topx.jsp and http://www.arcor.de/tp/hph/hph_topx.jsp?pos=5 . You can not iterate further. http://web.archive.org/web/*/http://www.arcor.de/tp/hph/hph_newpages.jsp (and Iterations!) allow for some discovery. There is a search function but it seems broken now: http://www.arcor.de/tp/home/treff_home_suche.php?querystring=test . It was working with single characters in the past (if Schbirid recalls correctly). According to the announcement at www.arcor.de/ums/, the homepages will be discontinued on 31.1.2017 (until then the users will have a choice to take their page to a new service at 1und1). Bigfoot U.S.A. http://www.bigfoot.com/~USERNAME/ Offline Lost Offered webspace and "Bigfoot Web for Life" profiles. ISP now defunct. CableAmerica U.S.A. http://users.cablemo.net/~USERNAME/ Offline Saved! CableAmerica Personal Web Space #cabledown treykeyus - The FTP login is broken so it is probably only a matter of time till it dies for good. 1, 2, 3, 4, 5 "wkweb machines" ISP webspace provided by now defunct cableinet.co.uk. Rebranded to Blueyonder Personal Webspace in 2001. ~90,000 items captured by Wayback Machine. http://calweb.net/~USERNAME/ Online! Not saved yet Calweb.com domains now redirect to a mirror at calweb.net. Wayback Machine indicates this was recent (~2017?). 100,000 calweb.com items in Wayback, very few calweb.net captures. http://home.casema.nl/USERNAME/ Online! Not saved yet Merged with Ziggo in 2008. Chariot Internet Australia http://users.chariot.net.au/USERNAME Online! Not saved yet Long defunct Adelaide based ISP merged with Datafast ~ 2002.
http://USERNAME.chebucto.biz/ Online! Not saved yet Topics and users can be found at http://www.chebucto.ns.ca/subject.shtml. Datafast Australia http://members.datafast.net.au/USERNAME Online! Not saved yet Long defunct ISP after merger with Eftel back in early 2000's. Demon UK http://www.USERNAME.demon.co.uk Online! Not saved yet No longer a personal isp, business only. Demon Internet Netherlands http://www.USERNAME.demon.nl/ Online! Not saved yet Merged with XS4ALL in 2006.
http://plato.digiweb.com/~USERNAME/ Offline Lost Pan-European defunct satellite ISP. ~25,000 items in Wayback Machine. Over 200 other domains from merged ISPs Online! Not saved yet A large percentage of the legacy ISP merged hosting is still online (200+ domains). Free France http://USERNAME.free.fr/ Online! Not saved yet By far the largest sample of early French internet still preserved. Reputed very stable. @Home Netherlands http://members.home.nl/USERNAME/ Online! Not saved yet Merged with Ziggo in 2007.
http://goodnet.com/users/USERNAME/ Offline Lost Arizona dial-up ISP. ~60,000 items in Wayback Machine (Sort by "Captured From"). KKI Poland http://www.kki.net.pl/USERNAME/ Offline Lost Self-proclaimed "laboratory" counterpart to host kki.pl. Site and webspace closed ~2002. ~90,000 items in Wayback Machine. http://home.planet.nl/USERNAME Online! Not saved yet Planet Internet was acquired by KPN Telecom in 2005 and merged with KPN in 2008.
http://customers.hbci.com/~USERNAME Offline Lost Minnesota ISP, rebranded to Hiawatha Broadband/HBC from 1998-present. Webspace likely closed mid-2000s. ~12,000 Luminet and ~40,000 HBC items in Wayback Machine. A couple of customer pages appear to still be online. http://koti.mbnet.fi/~USERNAME/ Offline Saved! MBinternet #mobinternet No longer an ISP, future of hosted sites uncertain. Netcom (UK) U.K. http://netcom.net.uk/~USERNAME Offline Lost Defunct. US company of same name merged with EarthLink. Ninja Homepage Japan See notes Online! Not saved yet Ninja Homepage has 340 domains. A full list of domains can be seen here. This page can also be used to see if a given subdomain is already taken for a certain domain. Additionally, users can use a domain of their own if so desired. Ono Spain http://webs.ono.com/USERNAME/ Online! Not saved yet Bought by Vodafone in 2014. UK http://mysite.orange.co.uk/USERNAME/ Offline Partially saved archives The formation of Orange UK made it the final heir of the Mysite platform, which they killed July 2008. 7,559 items saved in Wayback Machine. 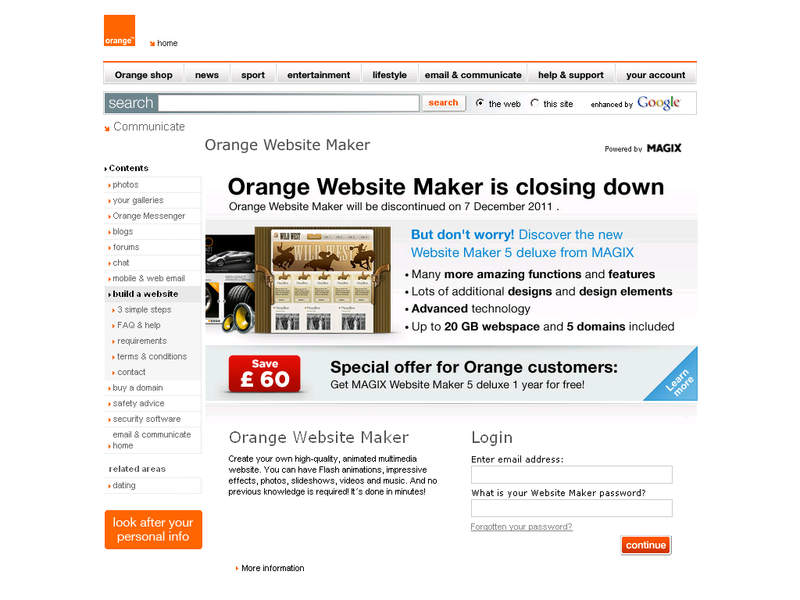 Replaced with Orange Website Maker (below). UK http://website.orange.co.uk/USERNAME/ Offline Lost A white-label version of MAGIX Website Maker. Closed ~2011, likely the contract ended. Orange suggested users migrate to original MAGIX product. A few (2,054) items in Wayback Machine. Ozemail Australia http://members.ozemail.com.au/USERNAME Online! Not saved yet Acquired by iiNet in 2005. Happened long ago but still 31,000 results in Google. Panix U.S.A. http://www.panix.com/~USERNAME/ Online! Not saved yet Third-oldest ISP. Pipex UK http://www.USERNAME.dsl.pipex.com/ Closing Not saved yet TalkTalk TalkTalk ownership. Deletion imminent 07/16/2018. http://users.globalnet.co.uk/~USERNAME/ Online! Not saved yet Plusnet has 3 ISP domains due to mergers over the years. A quick Google search indicates there are likely over ~50,000 personal and commerical active sites hosted on these domains. Plusnet is now owned by the ISP BT, but continue operations independently. prtc.net Puerto Rico www.prtc.net/~username Online! Not saved yet Many pages are old. QuickNet Netherlands http://members.quicknet.nl/USERNAME/ Online! Not saved yet QuickNet was parted of Multikabel. Multikabel merged with Ziggo in 2008.
http://tgn.net/~USERNAME/ Offline Lost Replace "AREA" with region. Qwest U.S.A. http://www.users.qwest.net/~USERNAME/ Online! Not saved yet Merged with CenturyLink. http://USERNAME.paginas.fcporto.pt/ Online! Not saved yet Creating pages is suspended. Existing users can continue editing their pages. http://www.USERNAME.pp.fi Closing Saved! Saunalahti Iso G #isohno Saunalahti and Kolumbus have merged with Elisa. Possible extinction. TalkTalk U.K. http://www.USERNAME.talktalk.net/ Closing Not saved yet TalkTalk Deletion imminent 07/16/2018. http://personal.inet.fi/private/USERNAME/ Online! Not saved yet There are many directories, such as /business/* and /cool/*. Sitemap? Telstra Australia http://USERNAME.bigpondhosting.com/ Online! Not saved yet http://www.users.bigpond.net.au/USERNAME/ might be the same or at least related. Tesco UK http://homepages.tesco.net/USERNAME Offline Lost UK supermarket that offered internet services. Webspace deleted 2012 and ISP bought by TalkTalk in 2015. TPG Australia http://users.tpg.com.au/USERNAME Online! Not saved yet User websites also available from http://users.tpg.com.au/users/USERNAME. Search results will have a mixture of both. One of AU largest ISP. http://world.std.com/~USERNAME/ Online! Not saved yet Oldest ISP in the world. http://website.lineone.net/~USERNAME Closing Not saved yet TalkTalk TalkTalk ownership. Deletion imminent 07/16/2018. Check "site:tripod.com inurl:sitemap.xml", you can get those with curl etc. (browser gets redirect). Not sure if all users, probably not. Ultinet U.S.A. http://ultinet.net/~USERNAME/ Offline Lost Business & Residential ISP. ~3,000 items in Wayback Machine. http://users.imag.net/~USERNAME/ Online! Not saved yet This PDF indicates 22 legacy companies Uniserve merged. Active customer hosting still exists on the 10 URLs listed. http://members.chello.nl/USERNAME/ Online! Not saved yet Merged with Ziggo in 2015. Versatel Netherlands http://home.versatel.nl/USERNAME/ Online! Not saved yet Merged with Tele2 in 2008.
http://www.users.greenbee.net/~USERNAME Online! Not saved yet Waitrose, a UK supermarket. Partnered with Greenbee Telecoms, which then rebranded to John Lewis Partnership. Pre-merger webspace sites online, but hosting not offered to new customers. Wanadoo (Members/mysite) UK http://mysite.wanadoo-members.co.uk/USERNAME/ Offline Partially saved archives ~200,000 sites saved in Internet Archive's Wayback Machine. Later Mysite Platform moved to Orange, see above. Ya.com Spain http://perso.ya.com/USERNAME Online! Not saved yet Bought by Deutsche Telekom and sold to Orange, still online. Ziggo Netherlands http://members.ziggo.nl/USERNAME/ Online! Not saved yet No new webspaces can be created (disabled on the 13th of April (not sure what year but will assume 2015)), but current webspaces continue to work for now. ZonNet Netherlands http://home.zonnet.nl/USERNAME/ Online! Not saved yet Merged with Tele2.